I wanted to post a few photos of my new Primitive Threads quilt in progress. 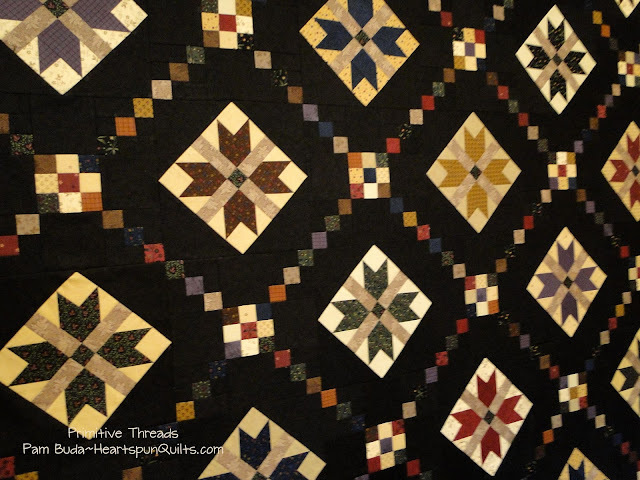 The quilt center is pieced and the borders are next. 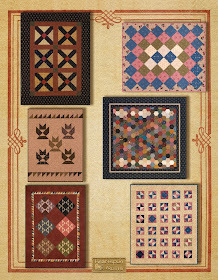 Laying out all the blocks on the design wall is so exciting because you really get your first look at what the quilt will really look like. I am really loving how the prints and colors are blending. Some of the neutrals are colored way more yellow in the photos than what they really are. 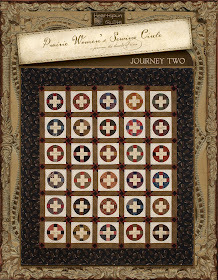 I didn't have much time to play with lighting and angles as we just had to get it pieced and off to Val for quilting. Once it's quilted and back home, I will do a better job with photos. I can hardly wait! 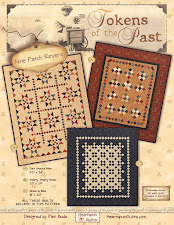 Primitive Threads will be delivered to your local quilt shop late May/early June!! 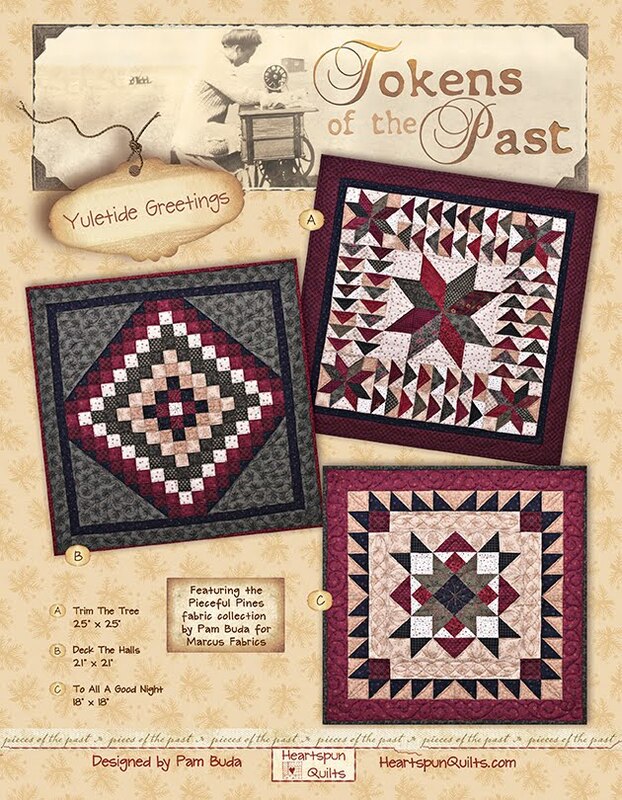 The three quilts for my new Tokens of the Past pattern, called Yuletide Greetings are now all quilted and bound. I hope to have (good) photos of them for my next post. In just a few days, my hubby and I will set sail with about 100 soon to be quilting friends on a quilting cruise to the Western Caribbean! I am beyond excited to escape this dreadful winter weather we're still having here in suburban Chicago, not to mention spending our days at sea with quilters, and fellow teachers Julie Hendricksen of JJ Stitches and Carol Hopkins of Carol Hopkins Designs!! I'm so jazzed about the fun week ahead. If this sounds like fun to you, too, please join us next year as we will again set sail for a Civil War cruise to new and exciting destinations! 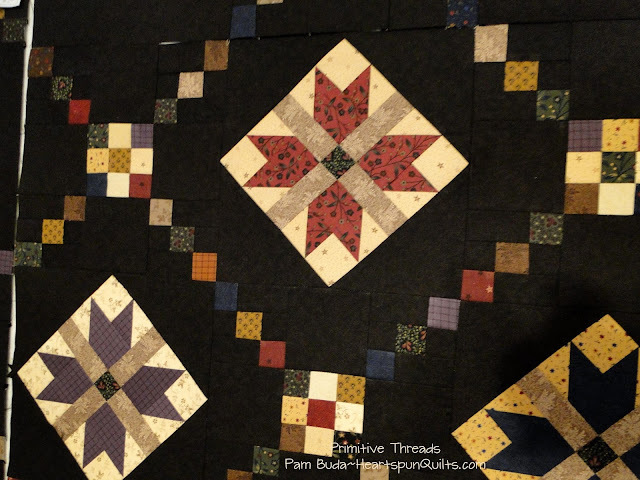 Joining me next year are fellow Marcus Fabrics designer and friend, Paula Barnes of Red Crinoline Quilts, and Connie Tesene of Country Threads!!! What a terrific line-up!! We will sail the Western Caribbean starting from Galveston, TX, then onto Cozumel, Grand Cayman and Jamaica! 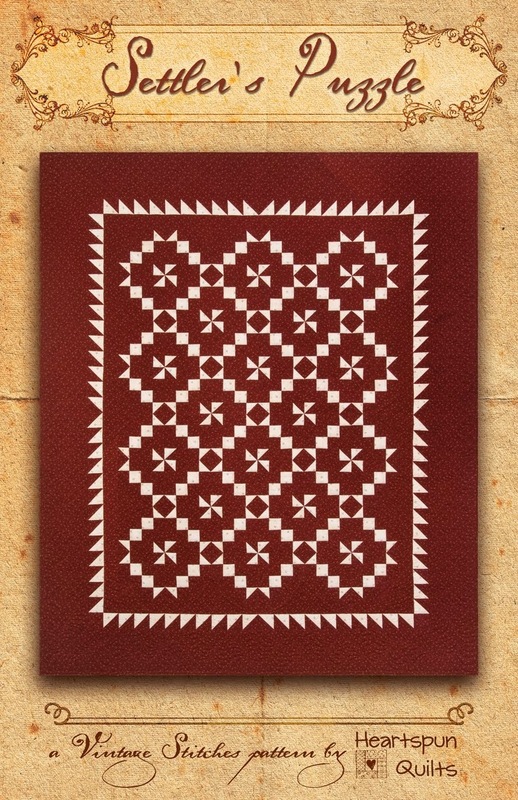 Three awesome quilt projects for you to create while at sea. 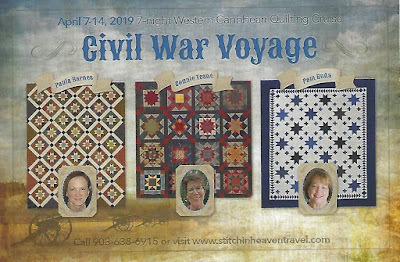 Click here for all the 2019 Civil War cruise details from Stitchin' Heaven Quilt Shop and Travel. 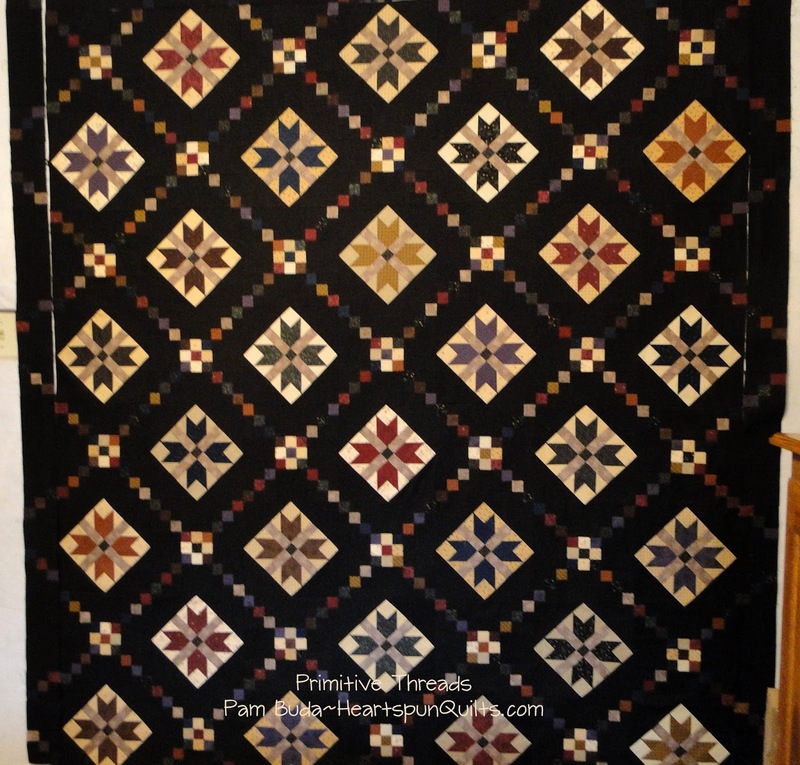 In between ordinary business, putting the finishing touches on my 2019 BOM and final Vintage Patchwork book edits, I've been working with my friend and co-worker Debbie to piece my Primitive Threads quilt. I'm presently working on the Flying Geese border and was merrily sewing them together. I always measure my units and to my horror, discovered none of them measured what they should! UGH!!! No, no, no, no, no! What is wrong?? I determined it was the rulers fault (liar liar pants on fire) and not the maker, that all the gorgeous taupe squares were cut 1/8 inch too small. Uh huh. Needless to say, I spent an evening with my seam ripper and a glass of Pino Noir. 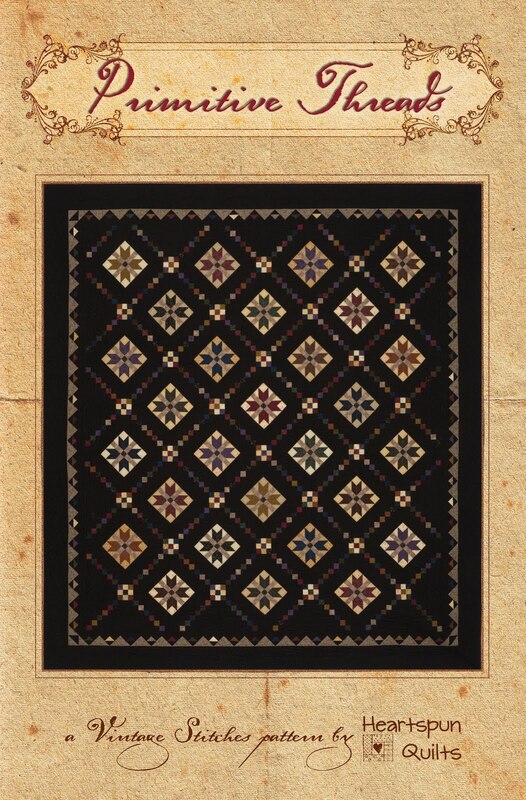 After having a talk with my ruler to set it straight, new taupe squares were cut and piecing the Flying Geese has resumed with a much better end result. 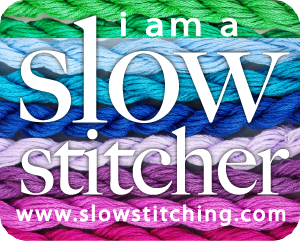 All quilters...all of us....spend time ripping. It's part of the experience, albeit one we'd rather not have. 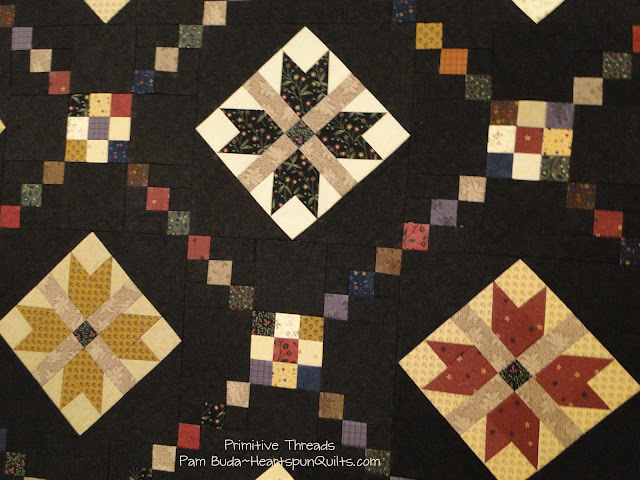 If you've been thinking about making my Primitive Threads quilt for yourself, you still have until tomorrow morning to PRE-ORDER the quilt kit and get the pattern free and reduced shipping. 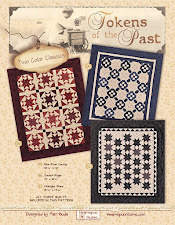 Click here to view Primitive Threads quilt kit details. Orders will be shipped when the fabric comes in, now scheduled for late May or early June. 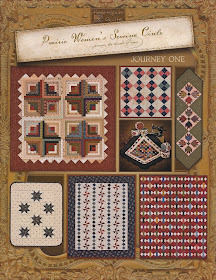 That is the same schedule when you can look for it at your local quilt shop....and please do look for it there!! As soon as I can post photos of the quilt I will. We have to have it done before I leave for the cruise so we can pass it along to Val to be quilted. So...that means I better get back to my sewing machine. Hope you are able to spend some time with your sewing machine and NOT your seam ripper! Announcing My First Book!!! 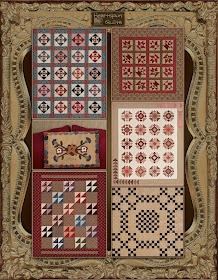 Vintage Patchwork!!! 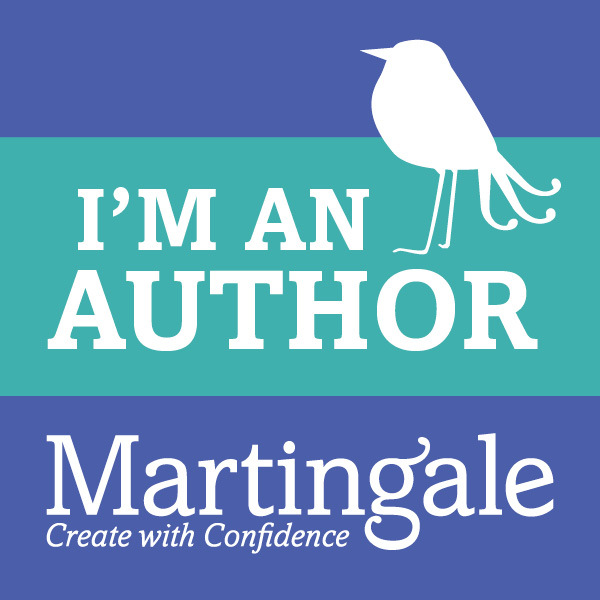 This was one of the hardest secrets to keep for the last year, but today.....I get to share the news that my first book with Martingale Publishing is coming soon!! Yippee!!! I'm so jazzed to tell you all about it!! Here's the book cover....and I love it! 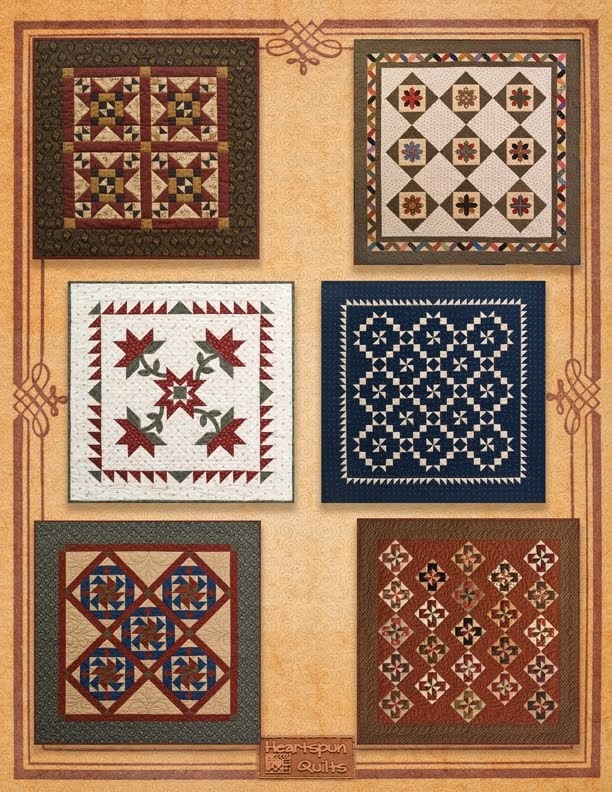 I challenged myself to see how many pieced projects I could create out of just one 10" x 10" precut of fabrics. Yup....buy yourself one 10" x 10" bundle and make a bunch of quilts and pinkeeps. How many projects, you ask? 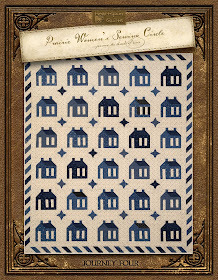 It won't surprise you that I chose to make all of the projects from a 10" x 10" precut of my own fabric.... Pam's Prairie Basics collection (for Marcus Fabrics), which gave me a whole lot of colors and prints to work with. 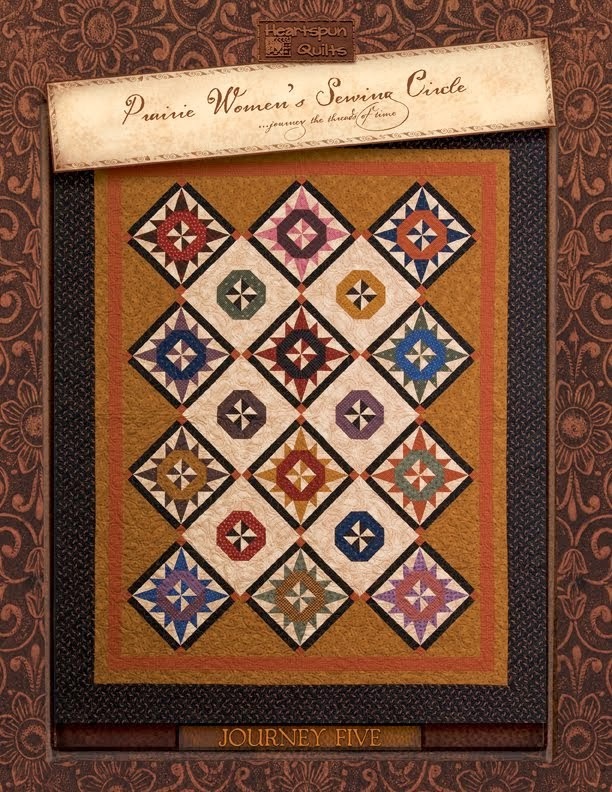 My Prairie Basics 10" x 10" precut will be available when the book is released and for some time afterward, so you can make your projects just like mine! Some of the quilts are doll sized and I had great fun piecing them. Some are what I'm calling "bookshelf" size. 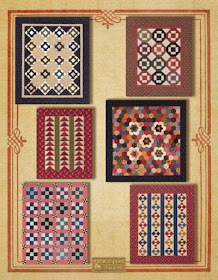 They're teeny, tiny sweet little pieces of patchwork that I love to display in small spaces here and there. There are also some really great pinkeeps to make for your collection. 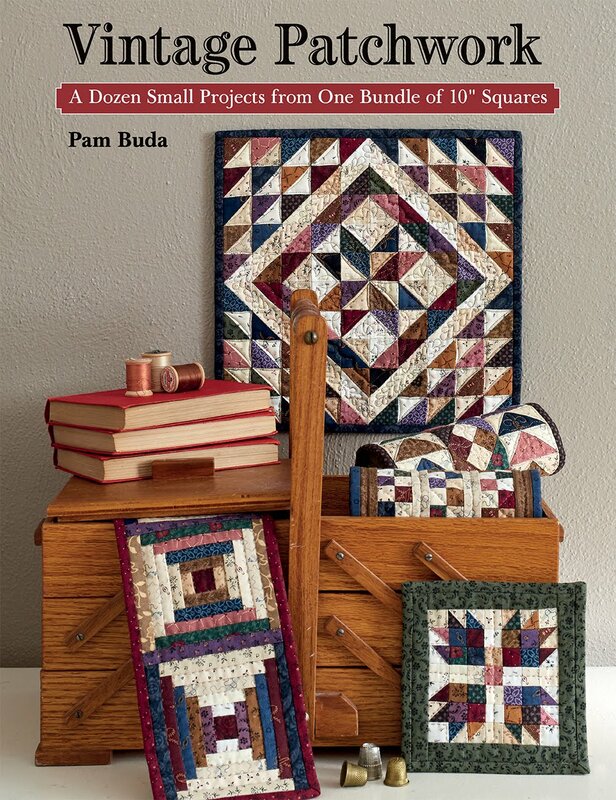 Soon....I'll be able to share photos of all of the projects in the book. But...for now at least, I can share what the book cover looks like. I'm just thrilled to be a part of the Martingale family! 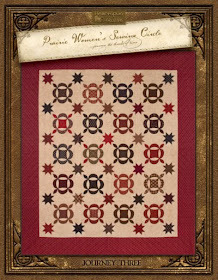 Vintage Patchwork will be released in October, just in time for fall quilt market. I can hardly wait!